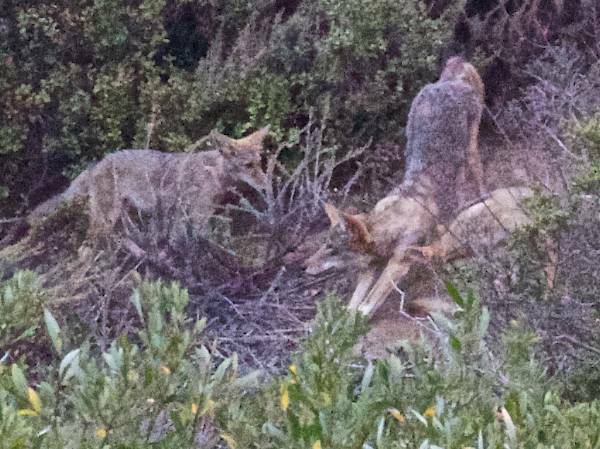 I peeked through an opening in the bushes into coyote family life during the hour before their active life begins in the evening at dusk. This entire family was together: mother, father, uncle and one pup. There is only one pup in the family. The pup is super-well protected and superbly indulged by the three adults in the family: the third adult is a male from a previous litter who I will call Uncle, even though that’s not exactly what he really is. The hour was spent in constant interpersonal interactions — there was not a moment when something was not going on or when some interaction was not taking place. 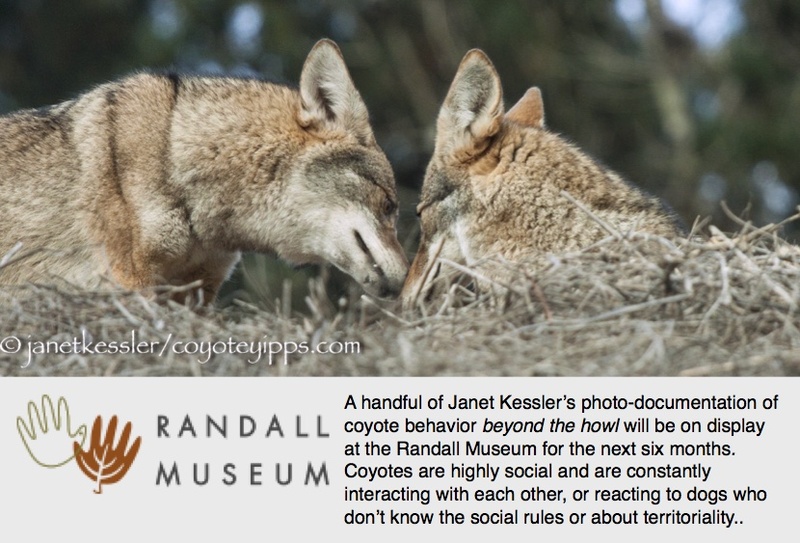 Coyotes are some of the most social of animals, and their social life takes place via their intense family life. The activities during this hour included Mom grooming Dad and vice-versa, Mom grooming Pup and vice-versa, affectionate play between Mother and Pup, all four coyotes aware of me and glancing at me in the far distance, Dad dominating Uncle — this happened continuously, Pup dominating Uncle who is low man on the totem pole, Uncle standing off to the side alone with ears airplaned out submissively, Pup hopping and jumping around trying to get others to play — as any only child might. And, most interesting, a sequence where Pup jumped on Dad (oops) with unexpected consequences and confusion. Grooming, playing, cuddling and general interacting were constant activities (below). This sequence (below) was pretty interesting because Dad ended up disciplining Mom instead of the Pup who caused the disturbance! Pup had jumped over — or onto — his parents who were lying next to each other. Dad either got confused and disciplined Mom — she’s the one lying on her back as he stands over her — OR, Mom’s growl at the Pup may be what Dad was reacting to. Dad coyote does not tolerate any aggression in his family, even from Mom. At the first sign of any antagonism or dissent, he squelches it. Dad is the oldest and wisest in this family, and the ultimate authority. In another family I know, Mom is the ultimate authority: every family is different. He actually disciplines Mom — is it by mistake? Rigid status preserves order, but sometimes it’s hard to watch. Uncle is low man on the totem pole, and he’s made aware of this constantly: what is Dad’s “order” is Uncle’s strife and oppression. There seemed not to be a minute that went by when Uncle was not reminded of it. It happened with physical put-downs three times in this hour, and in a more subtle manner, with glances, many more times. Dad stretched, which meant it was time to go. As it got darker, the time came for the family to trek on. The move was signaled by Dad’s signature stretching. Dusk had settled in and their day was beginning. And my viewing time had come to an end because as they slithered away into the night, I could no longer see them.